Does Being Wealthy Make You Greedy? In a recent GOBankingRates survey that polled Americans on their biggest financial goals for 2014, two-thirds of top-earning respondents — those with an annual salary exceeding $150,000 — said getting a raise was their top financial resolution in 2014. These respondents were almost six times more likely to cite getting a raise as their primary financial goal for the new year than the next group, those making $50,000 to $74,000 annually, of which only 11.5 percent said they were aiming to increase their income in 2014. On the other hand, 42 percent of respondents who make $24,000 a year or less prioritized saving money. When it comes to money, it seems that the more you have, the more you want. A Pew survey published in August 2012 found that 55 percent of respondents viewed the rich as more likely to be greedy and dishonest than the average American — though they also were more likely to view them as intelligent and hardworking. But is this widely held view correct? Lifestyle inflation can contribute to this; as individuals earn more, their spending also increases, as they buy more often and more expensive items. They get used to this new lifestyle and their ability to live within their means is diminished, even as their wealth increases. And the pursuit of money can become an end in and of itself, a constant quest that becomes its own addictive reward system. Personal finance writer James Altucher describes what being rich felt like for him as he rode the dot-com boom of the ’90s to a status as a multimillionaire. And as the wealthy get wealthier, each million does seem easier to come by as the resources they can use to chase after wealth increase. But this imbalance has widened greatly to a precipitous point — “almost half of the world’s wealth is now owned by just one percent of the population,” according to a report from British humanitarian group Oxfam International. 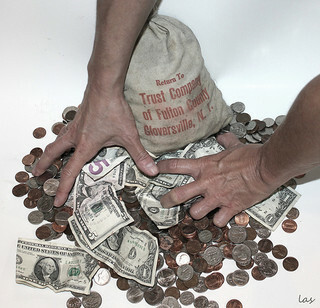 Related: The Psychology of a Cheapskate: Can You Be Addicted to Saving Money? “In just about every way you can study it, our lower-class individuals volunteer more, they give more of their resources — they’re more generous,” said Dache Keltner, a professor of psychology at the University of California, Berkeley, and one of the researchers behind the study, in an interview with NPR. Indeed, when comparing three levels of annual household income — $50,000 to $99,000, $100,000 to $199,000, and $200,000 and up — a 2012 survey from The Chronicle of Philanthropy found that households who earned the least gave nearly 50 percent more, donating 6 percent of their income, compared to 4.2 percent from those making $100,000 and above. In fairness, however, money’s ability to corrupt people extends beyond the upper crust. Simply being exposed to money-related phrasing or words can make an individual more likely to lie or make immoral decisions, according to research published in the journal Organizational Behavior and Human Decision Processes and conducted by researchers from Harvard and the University of Utah’s business department. “Even if we are well intentioned, even if we think we know right from wrong, there may be factors influencing our decisions and behaviors that we’re not aware of,” said Kristin Smith-Crowe, one of the study’s coauthors and an associate professor of management at the University of Utah’s David Eccles School of Business, in an interview with The Wall Street Journal. Simply put, when it comes to money, we’re all a little more willing to bend the rules of ethics. But Are You More Likely to Be Wealthy if You’re Greedy? Although wealth seems to make a person more likely to behave greedily, you don’t necessarily have to be wealthy to be greedy, and not all wealthy people are greedy. After all, greed is just the desire for money, the use of financial success as an extrinsic motivator in our lives. In fact, if a person believes that money is “bad” or will make them a more evil person, this can actually sabotage their chances for success, said Brad Klontz, Psy.D., a CFP and associate professor at Kansas State University. Learn which credit cards are easy to get even with bad credit. GOBankingRates > Making Money > Wealth > Does Being Wealthy Make You Greedy?